Surrounded by coral reefs, the Mackerel Islands are situated amongst some of the best fishing grounds in Australia. With your boat conveniently moored at the islands, getting to these fishing havens is only a matter of minutes, which means less time travelling out, more time fishing! Boat fishing here is seriously among the absolute best in Western Australia. And all can be caught a short distance from the islands! This coveted assortment of fish suits a variety of fishing types from jigging, fly fishing, throwing soft plastics and popper fishing in anywhere from 1 – 80 metres of water. These are specialised types of fishing that attract people from all over the world just to test their skills against nature’s finest. 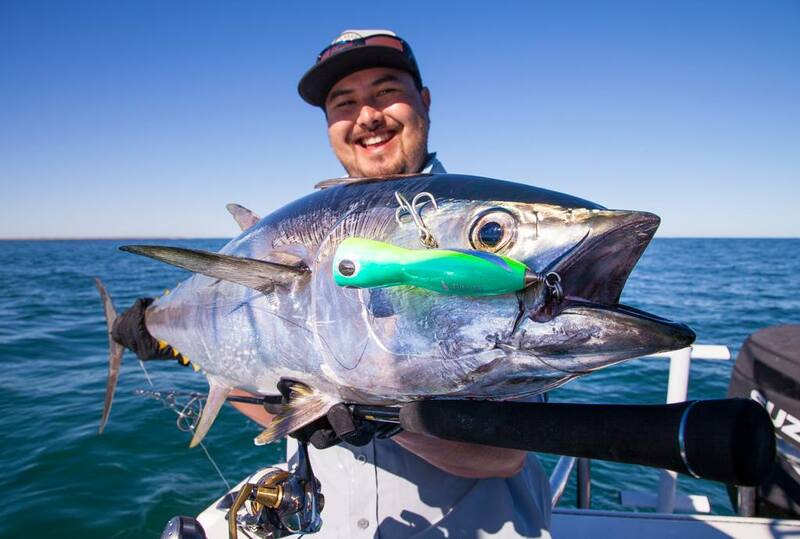 Sports fishing (catch and release) is popular, targeting species such as coral trout, giant and golden trevally, giant queenfish, yellowfin tuna and spanish mackerel, and will test even the most experienced sports fishermen and women. The network of underwater banks and exposed reef ecosystems provide endless opportunities to discover and target new schools of fish every day. Red emperor, rankin cod, crimson sea perch, and a wide variety of northwest snapper can be caught while bottom fishing. In the sheltered and protected waters of the islands large schools of tuna and mackerel are often seen rounding up bait fish to the surface, a perfect opportunity to cast some lures or have a troll. Trolling the drop-offs around the islands and reefs is where you will catch large Spanish mackerel, tuna, wahoo and bill fish just to name a few. Many discussions are had as to type of bait, rigs and techniques to use to catch each species, however it is often the novice who just simply puts a line in the water that wins catch of the day! Thevenard Island is well equipped for boat fishers, offering moorings, fuel, ice, bait and tackle through our general store.